The Enzyme-linked immunospot (ELISPOT) assay was developed by Czerkinsky in 1983. 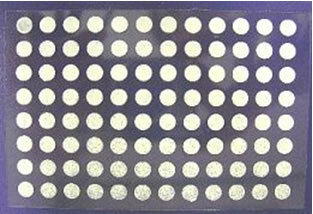 The ELISPOT assay is based on, and was developed from a modified version of the ELISA immunoassay. It is a sensitive method for monitoring immune responses in humans and animals and a superior tool for accurate quantification of cytokine-secreting T cells. Cells are incubated for a defined length of time in the wells of the ELISPOT plate precoated with a high-affinity monoclonal antibody to which the cytokine, produced during incubation, will bind. Subsequently, cells are lysed and debris is washed away. Areas in which the cytokine has been captured by the coating antibody are detected with a combination of biotinylated anti-cytokine detector antibodies and enzyme-labeled streptavidin or anti-biotin antibodies. 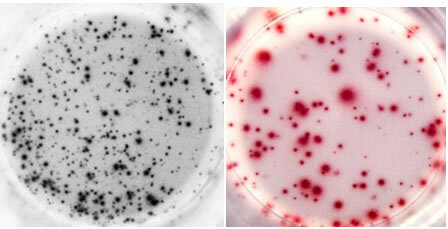 The last step in the assay is the addition of a substrate yielding a colored zone ('spot'), which reveals the site of cytokine secretion. Eli. Scan is a cost-efficient solution for labs which have only a limited number of plates to measure and no demand for a high throughput system. It has been designed for the exclusive measurement of punched-out well bottoms from Millipore MultiScreen® plates detached Nunc SilentScreen® membranes and is characterized by a very compact design and a high scanning speed. The instrument comes as a complete system including scanner unit, PC with Windows 7 Professional®, ELISPOT Analysis Software V5.1, TFT screen, color ink printer and two years warranty. Optionally Eli.Scan can be ordered with a notebook instead of the office PC. It is able to measure ELISPOT Assays based on detached Nunc® membranes or punched-out well bottoms from Millipore® plates. 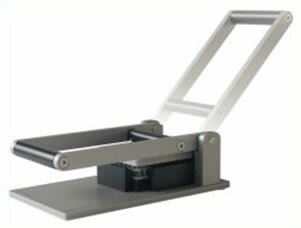 In addition it supports the analysis of 6/12/24/48 and 96 well microtiter plates with transparent well bottoms. The instrument comes as a complete system including scanner unit, PC with Windows 7 Professional®, Eli.Analysis Software V6.0, TFT screen, color ink printer and two years warranty. Optionally it can be ordered with a notebook instead of the office PC. The dual-color FluoroSpot assay is a modification of the ELISPOT assay and is designed to detect double cytokine-secreting T cells at the single cell level. The assay is based on the use of fluorescent-labeled conjugates, which can be visualized by fluorescence microscopy or by a fluorescent immunospot image analyzer. 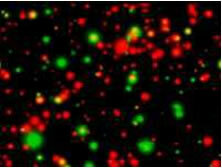 The FluoroSpot assay involves simultaneous staining with both Alexa 488 (green) and R-PE (red) dyes visualizing cells that produce the two cytokines of interest. Cell that release both cytokines become visible as yellow spots. The kits are supplied with PVDF membrane-bottomed (PVDF) plates, which are specially optimized for the FluoroSpot assay.